This page is your best resource for the latest construction updates that could possibly impact your trip to Fort Sanders Regional Medical Center. Please continue to check back frequently throughout the construction process. If you are traveling to Fort Sanders Regional Medical Center in the days ahead, be aware that construction is now underway for the expansion of the emergency and critical care departments. As part of this extensive project, several access points for the hospital are changing. Beginning Monday, Feb. 4, the existing ambulance bay and emergency department entrance on 19th St. will be relocating. A large construction fence will be installed between the Center for Advanced Medicine (CAM) parking garage and Trustees Tower at Laurel Ave. and 19th St., prohibiting access to the existing ED drop-off and ambulance bay. Emergency department patient drop-off will be routed through the Trustees Tower garage located on Laurel Avenue. A staffed receiving area has been built on the southeast side of the garage near the elevators to assist patients. Directional signs will be placed around the hospital to direct patients to the new entrance. Ambulance Bay Moving to Clinch Ave. The ambulance bay will be moved to the front of the hospital on Clinch Avenue for the duration of the project. 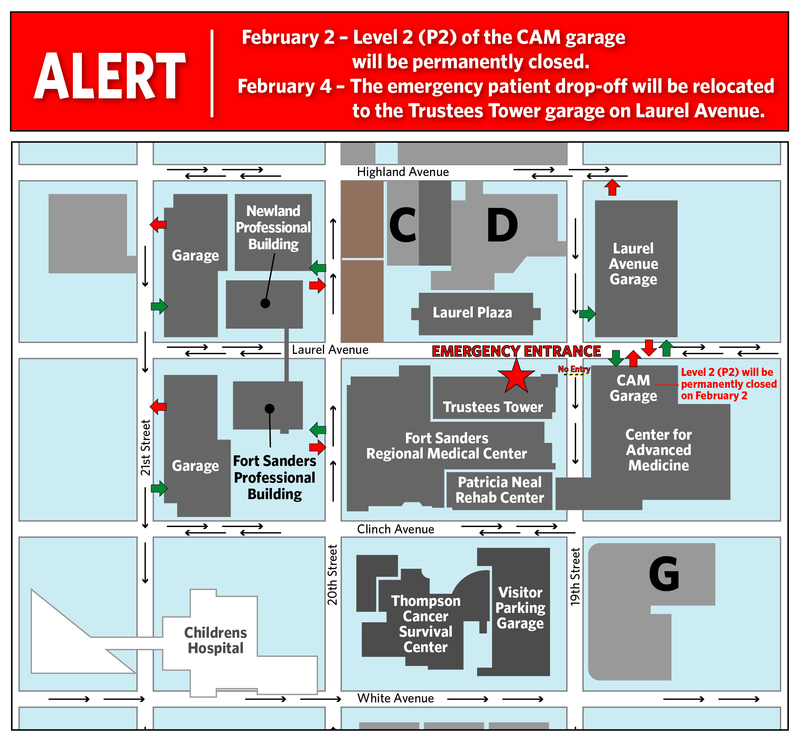 The P2 level of the CAM garage will be closing permanently on Saturday, Feb. 2. Patients and visitors will be redirected to park in the Thompson Cancer Survival Center garage off Clinch Avenue, Laurel Avenue parking garage off Laurel Avenue, or the P1 level of the CAM garage. Beginning Monday, January 14, scaﬀolding will be erected surrounding the North side of the Center for Advanced Medicine. It will take approximately 3 weeks to complete the installation of the scaffolding. The construction fence already in place on Laurel Avenue will surround the area. The scaffolding is necessary to prepare for the construction of the fourth and fifth floors of the CAM building. The crane is up, and construction is officially underway. Despite the busy holiday season, we continue to make preparations for our expansion project. See below for a list of updates on both ongoing and upcoming projects. Renovations on the carpeted stairs on the lobby level will begin soon. Patients and visitors will need to use the adjacent stairwell or the blue elevators to access these areas. The P2 level of the Center for Advanced Medicine parking garage will be closing very soon. Patients who park on this level will be redirected to park on the P1 level of the CAM garage, Laurel Avenue garage or Thompson garage.